Sometimes it can be really hard to feel like you have actually ‘discovered’ a newly published novel for yourself these days. That is to say, without being preconditioned by advance publicity and PR, prompts from Amazon or even ‘trailers’ on the web. New books, especially when released by a major publisher, can be preceded by such an engulfing cloud of gushing comments and publicity that it is hard know how to react to that, even if only at a subconscious level. In the case of this book though I am glad to say I was able to dodge this – and I think it had a really beneficial effect. I in fact received it out of the blue, on the occasion of my birthday, from an old pal I don’t get to meet often enough. 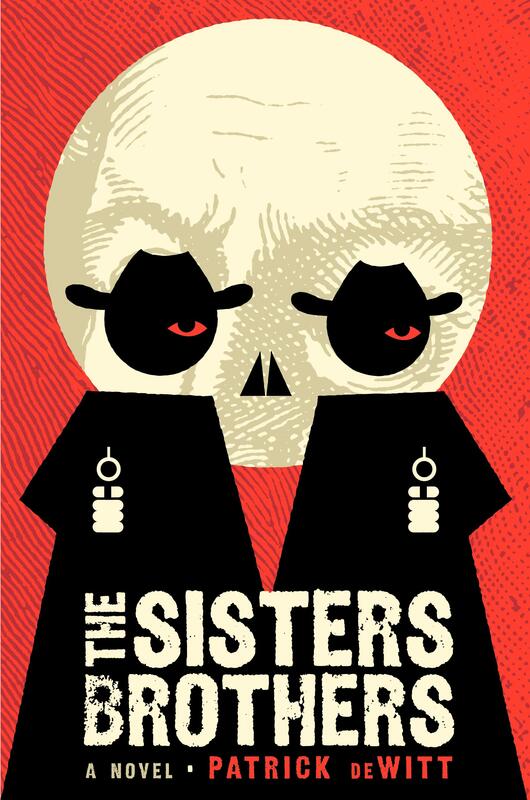 Because she reads a lot and has great acumen, even though I had not heard of it, I knew I would want to knuckle down and get involved in the oddly titled The Sisters Brothers right away. Beginning in 1851 Oregon City, this novel of the Old West takes the same premise as Hemingway’s classic short story ‘The Killers’: two men are contracted to find a man they have never before met and end his life. But whereas that spare and allusive short story worked well precisely because the motives for the actions remained unknown to us even at the end, focusing instead on the ritual of the actions, this is a picaresque novel of character, full of tragi-comic incident in a slightly askew, magic-realist atmosphere. The eponymous gunslinger protagonists are Charlie and his brother Eli, who also narrates. As they progress South they encounter a variety of strange people and situations on a journey that will take them through San Francisco and finally reach a dam infested with beaver in Sacramento. Charlie has been put in charge by their employer, only known as the ‘Commodore’, which upsets the more sensitive and introspective Eli, who comes slowly to re-evaluate his feelings for his sibling, though we are never in any doubt as to the essential closeness of their relationship. Eli is fat and craves attention but also has a violent temper and this is exploited by his more calculating if frequently drunken brother – Charlie is the one who makes the decisions and Eli has grown used to being the back up. But as they travel, Eli begins to question the motives for their lives as killers, reaching out for a new kind of life while having to deal with the violence and strangeness surrounding them. “I don’t understand the purpose of this story”, I said. A MacGuffin is introduced two-thirds of the way through the book in the form of a secret formula as the boys reach San Francisco, depicted in great colour as a boom town sucking the money and the vitality of those that live here. This puts them on the right scent for their quarry, the wonderfully named Hermann Kermit Warm, but also seems to point to a potential way out of their careers as killers – will they make it? At once a story familiar from many a pulp tale of burned out professional assassins who want to turn over a new leaf, this also echoes the grandaddy of classic homecoming narratives, Homer’s Odyssey – without getting too fanciful, our protagonists also find their journey delayed by witches, slothful lotus eaters and one-eyed villains, are thrown off-course by sirens and have to pay dearly for engaging in a hunt. Although essentially naturalistic, deWitt also steps aside slightly in two very brief ‘intermissions’ in which a little girl, symbolising death, makes an appearance in the lives of Charles and Eli. This is very much a novel in the modern mould, by turns comic and ghastly in its mixture of the strange, the surreal and the grotesque, reminiscent of the likes of John Irving and perhaps even Tom Robbins. It has also been compared to the films of the Coen brothers, especially their recent adaptation of Charles Portis’ True Grit, with which it shares the Western setting and a near-Victorian use of formal dialogue for largely comic effect though it seems to have more in common with the more magic realist movie Dead Man, written and directed by Jim Jarmusch and starring Johnny Depp. There are all sorts of literary and movie allusions here, and the latter parts of the novel, in which retribution arrives from a succession of unexpected quarters, certainly has more than a touch of The Treasure of the Sierra Madre about it. On its own terms though this is a funny and evocative novel in which bizarre episodes – notably one involving a bear, a horse, a witch’s curse and a cabin with a window too small for the corpulent narrator to fit through – and a highly peculiar cast of characters – poetic killers, foolish youngsters, tubercular ladies and one-eyed horses – combine with a fascinating depiction of time and place, both in the new cities and out in the harsh wilderness. On top of this, to its credit the plot is kept in check throughout which is often a failing with novels that take a slightly comedic approach to character and situation, but this is a book reminiscent of the dreamscapes created by William Faulkner providing an eccentric but internally consistent logic all its own. If its ultimate meaning remains obscure even by its conclusion, it still makes for a flavoursome journey, the frailties and peculiarities of its two killer protagonists explored in fascinating and surprising detail. This entry was posted in Man Booker Prize, Patrick deWitt, San Francisco, Scene of the crime. Bookmark the permalink. The premise of this book sounded so intriguing I rushed out to buy it, but it has been sitting on my nightstand since then (I think for over five months) waiting impatiently to be read. Other books came along and The Sisters Brothers keeps getting buried and being ignored. Now I think I will finally get to reading it. Thanks for this review. And a Booker Prize nominee! Cool. At least I know that I bought it BEFORE it was shortlisted. Hi John – thanks very much for the comments. I hope to review a couple more of the Booker nominees soon, though in this case it was just general ignorance as I had not heard anything about this book in advance. I would be a bit surprised if it won just because it does belong to that Western Noir tradition and genre titles, when perceived as such, tend to lose out unfortunately – which means that it’s probably a major achievement that it got nominated at all, though i think it does stand up as a work of serious literary merit. Really looking forward to hearing what you think of it. I’m not sure if this is really for me, but I still enjoyed reading your review. Well, the truth is, I generally do. Good writing is good writing even the book is something that you might not consider reading. Thanks Yvette – I don’t think anyone would want to argue with that – Although I did enjoy this book a great deal, especially as it was such a surprise for me, it is a pretty rich and heavy meal shall we say so i certainly couldn’t handle too many of these – it’s definitely back to ed McBain for my next review! HALF BLOOD BLUES, one of the Booker shortlisted titles, is a crime novel. Seems very much a part of the genre even if it wasn’t marketed that way. Of course there are a elements of social criticism in it as well. And then there’s the fanciful JAMRACH’S MENAGERIE which has a fantastical side to it. This year seems to be quite a varied lot from the usual literary novels that the Booker Prize people tend to drool over. No surprise that the favorite – Julian Barnes – won today. Hi Christopher, thanks for the comments. I had heard nothing about it at the time and found it to be a really surprising. It ‘aint perfect, but it is certainly distictive and as you say, very readable, a remarkable rare commodity these days!